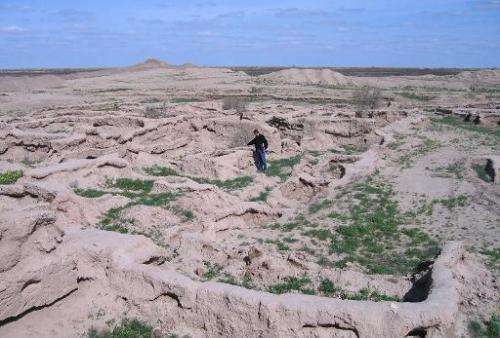 The leader of Turkmenistan on Sunday pledged to streamline water use, a huge problem in the isolated desert nation believed to be among the world's top water wasters. Some 80 percent of ex-Soviet Turkmenistan is covered by the Karakum desert, one of the driest places on earth. Addressing Turkmens on the Day of Water, a national holiday, President Gurbangly Berdymukhamedov pledged to curb waste. The government would oversee the "systematic introduction of conservation technologies in the construction of water facilities and systems, the application of best practices and the latest scientific achievements", he was quoted by state media as saying. The post-Soviet states of Central Asia—which have mostly failed to repair outdated irrigation networks but keep producing water-intensive crops such as cotton—are among the world's worst water wasters. The scientific weekly Nature said last year that Turkmenistan was the world's top consumer of water per capita. Households in Turkmenistan do not pay for water consumption. While water use was centrally managed under the Soviets, tensions have brewed between states upstream and downstream of the famous Amu and Syr Darya rivers since independence. In 2012, Islam Karimov, the veteran leader of Turkmenistan's neighbour Uzbekistan, warned that disagreements over water sharing could spark war in the region.